As a Property Manager of many single family homes throughout the Denver Metro area, I have often needed to find a plumber whether for emergencies or just everyday problems. 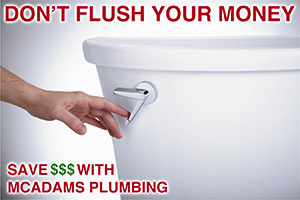 In the many years I have been working as a Property Manager, I have never had a company impress me like McAdams Plumbing. On my initial call I was greeted with a live person named Chris, who was exceptionally polite. He understood my needs, was compassionate about my personal situation and sent someone over to my rental property right away to look at the main sewer line that seemed to have backed up. Chris explained what the charges would most likely be prior to the work being done. The prices were honest, very reasonable and it not only made me extremely happy, but also the Owner of the property very pleased as well. When we received the bill, there were no surprises and the charges were exactly as Chris had stated. This day and age it is hard to find companies that hold such a high standard for quality work, honesty and customer service. I was so pleased with their company all around and would recommend them to anyone in need of plumbing services, including any Property Management Company. They are truly wonderful. 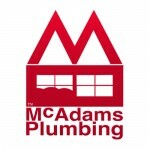 Thank you so much to the Team at McAdams Plumbing, I truly appreciate everything! 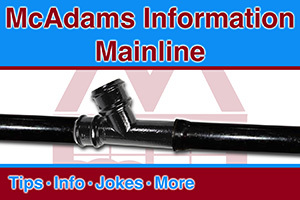 Customer Review Phillip Pride Review 7/01/12 I hired McAdams Plumbing to install a garbage disposal, 2 sump pumps, replace a leaky toilet and all the piping connected to the new sink. He was on time, and the prices were good. He did good work. He was honest and helpful.